I ate here during orientation for GW Law and the food was flawless. They also make garlic fries that were bae. I really wanted to like this truck based on the other review on here. However, I found the food to be mediocre at best. This is pretty disappointing given that I usually wouldn't eat something this unhealthy (especially for lunch) and thought of it as a treat. The payoff is definitely not worth the calories and fat. 1) I ordered the slider that indicates it has "crispy" bacon on it. Unfortunately, the bacon was definitly not crispy. To me, this is a cardinal sin of bacon. I love cripsy bascon (the kind that snaps off and disintigrates into your mouth in bacony-goodness) but hate chewy bacon. I relied on the description in ordering and wound up pulling off 90% of the bacon because it was not crispy at all. 2) Too much salt! This was true for both the sliders and the garlic fries. This was especially bad for the garlic fries. The garlic seasoning was great during the few times it wasn't overpowered by the bitter taste of salt. The salt should be cut down significantly. I realize there are people that love a lot of salt...put out salt shakers for these people so they can up their sodium levels to their heart's (dis)content. 3) Proportions were off. I liked the roll the sliders came on. However, the beef-to-roll ratio was off. There needed to be at least a bit more beef for that size of roll. Some of the toppings proportions were also a bit off. The main culprit were the pickles on the bacon burger. The very thick pickle slices may work on a large, full-size burger but are overpowering on a small slider. This was my first try of this truck. The fries are a bit soft but have excellent topping! The burgers were OK, leaning toward dry. I have to deduct points for the skimpiness of the toppings -- two tiny green leaves of something does not measure up to "greens" as a topping. A tiny squirt of ketchup that barely stained the bun. I did not get any mayonnaise depsite requesting it twice. My colleague's "philly" came with one small strip of onion and one similar strip of pepper as topping. The staff is nice but they have difficulty with any sort of request that varies from the listed ingredients, including just leaving something off. For $12, my colleague and I think there are much more satisfying truck options. Juicy burgers, tasty fries, On the big side for "sliders" - more like midi-burgers. Inch-thick, hand-crafted patties. Fries were soggy by the time I got back to my office - maybe I'll ask them to dip them in the deep fryer before I leave. I got the Buffalo Chicken Slider (I forget the clever name they gave it) and a bacon cheeseburger slider with their fries. while their sliders ARE AMAZING, THE FRIES STEAL THE SHOW!! The seasonings and garlic concoction they toss them in right out the oil is TO DIE FOR! This is my favorite truck by far that has been to my job! I hope they come back ASAP! I ordered the BBQ sliders today and fries and I must say the fries were absolutely delicious. They were crispy and well seasoned. The Burgers were cooked perfectly and very tasty. Today was my first day eating at the food truck but it was worth every dollar spent. Please come visit us a Ballston agian. I got two of "the District" sliders (with cheese, tomato, micro greens, and ketchup), and the garlic fries. The sliders were good - tasty, juicy, and pretty big for sliders (next time I might just get one). And the fries were excellent! Crispy on the outside and the garlic flavor was perfect. I think this is actually a pretty good deal for $12 - I was stuffed and didn't nearly finish the fries. I will definitely keep an eye out for this truck in the future! I bought lunch at the DC Sliders truck today in Reston. In fact, I was the first customer. I got the sliders & fries for $10. I didn't order a drink. I bought lunch at the DC Sliders truck today in Reston. In fact, I was the first customer. I got the sliders & fries for $10. I didn't order a drink. I was disappointed to find out that "burgers & fries" actually meant burgers & chips. The chips were ok & I'm sure they were homemade, but I was expecting fries. The sliders were hot & tasty. I also got the chocolate cupcake for $3.50. The cupcake was very good & fresh. The food was good but I felt paying $14 was a bit over priced for two sliders, chips & an average size cupcake. 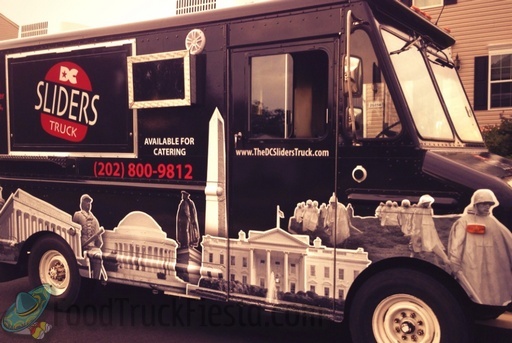 DC Sliders is serving Gourmet Handcrafted Slider Burgers in our Nations Capital. They launched on August 12, 2013 in Loudoun county.